This addon helps support your guild financially, which is a requirement in a lot of guilds with traders. Really appreciate the addon, however it is causing major headaches for me. Any help would be appreciated. My GM's have been complaining for a few weeks because my dues are either the wrong amounts, or paid on wrong day (late) or not paid at all. I think I finally figured out what is happening. This addon is "Guild aware" ONLY on the guild page it seems (G). But on the guild bank page it is NOT aware and it also doesnt tell you the name of the guild that is currently "selected" by addon. 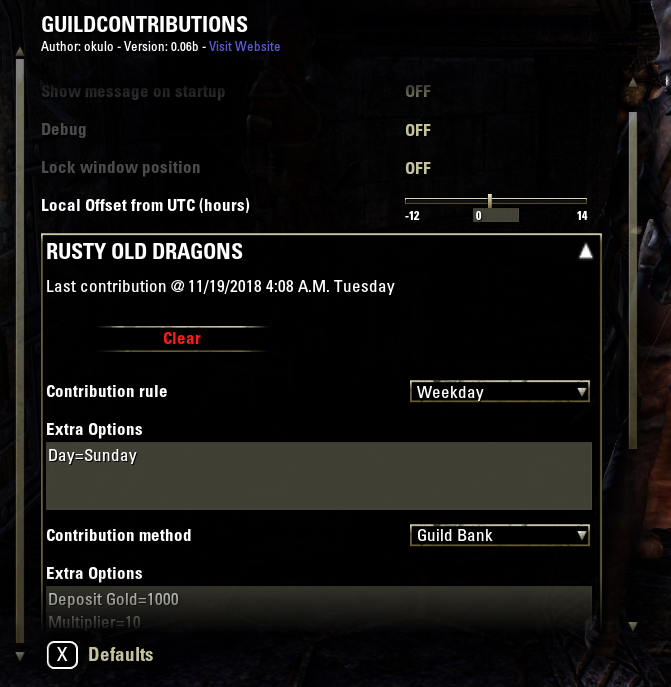 Friday I had to invite someone to guild 5 through the guild screen (Key G). This addon recognizes guild 5 correctly an "selects" it. Then I was in guild 2 bank depositing ITEMS, the addon STILL has Guild 5 "selected" It tells me dues are due, so I hit the pay button and it pays Guild 5's dues into Guild 2 bank. 1. 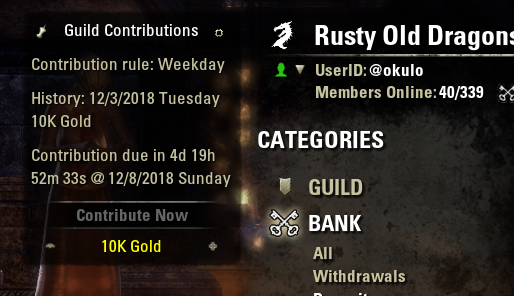 I have OVERPAID Guild 2 bank by 5k. 2. 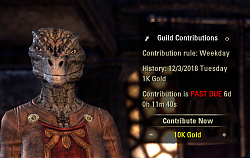 The addon THINKS I have paid guild 5 dues. 3. Because it isnt guild bank aware it doesnt realize I was in guild bank 2 when pay button pressed so it thinks I STILL owe Guild 2 dues. 1. Since I had last pulled up Guild 2 on guild screen, guild 2 is selected by addon. 2. Guild 2 is selected by addon, and Im in Guild 2 bank and hit pay button thus putting in an additional 5K. 3. 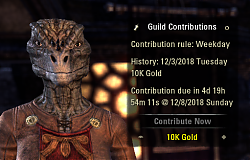 Guild 2 is now overpaid by 10K. 4. 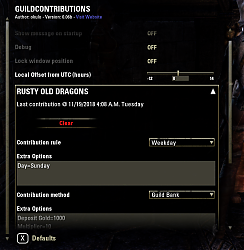 Guild 5 STILL hasnt been paid but addon still thinks it has. Can anyone else replicate this behavior? I do have a ton of add ons and want to make sure this isnt a compatibility issue. but I'm down to 2,500... what gives??? Last edited by Alessondria : 10/14/18 at 02:38 PM. could you hide the login text unless its (configurable) days before payment is due? I'd like a login reminder but only when its needed. @RavenMind - I just added a feature to track the "last" donation; no histogram or any coverage past that. @Assassin AKA Talon - The contribution window corresponds to the guild you have selected; switch to another guild through the UI and it will update. @vecny.samotar - Bank withdrawal is probably a more complicated feature. If the contribution is small enough, you could possibly do it with proceeds from crafting dailies or something. I usually keep a fairly large amount on one character, as that's the main one I post items from. The tricky part is the context in which the contribution is available. To submit through the guild bank, you have to have the guild bank open; but you would want to withdraw from your personal bank for this. So it's not really feasible through the Game UI. would not be able to add the weekly deposit setting to add it automatically and the possibility to set up the filter from the extractor should be added to a deposit either from the bank or from the bank? Multiple guilds on same due dates. I have 3 guilds with dues due on Friday and 2 due on Saturday. The first guild donation goes fine but then the button is greyed out no matter which guild bank I am in. Is there a trick to setting up multiple guilds with the addon? Just stumbled across this. I've been looking for something like Shissu's Donate Fee, and this looks like it will fill the bill! Downloading now! I noticed in the screenshot that it has a "last donated" date. Is there a possibility to track donation history dates & amounts? Also it said in the description that donation via the addon is generally not available unless the rule has been met. So if I decide to donate more to the guild, that won't be possible (or tracked) via the addon? Currently I just use Notebook 2018 to jot down my dates & amounts, but have been waiting & hoping for something to automate it a little. Thanks. It's been awhile since I wrote any addons, and I forgot the folder structure. The unzipped folder needs renamed to "GuildContributions" no numbers etc. would also add your Github instructions to the addon explanation, not many folks are likely to follow the link. For each guild you're in there are two policies that determine how contributions work. A rule defines when a contribution is required (how often, etc...). Generally, contributions via the window are not permitted unless the contribution is considered "due" by the rule; this is to prevent accidental over-giving via the GuildContributions UI elements. So for rules that define a due date, it should be set to the day after it is actually required by the guild leaders. The following rules are defined. No contributions are required, and you will not receive reminders about it. This is the default setting. Contributions are weekly, due on the specified day of the week. Contributions are considered due at the beginning of this day. Contributions are considered late at the beginning of the next day. When you change this setting, it will target the NEXT occurrence of this day. Contributions are simply annotated, no gold is transferred automatically. This is the default setting, and should be used for complex contribution requirements. When the guild bank is open, you may deposit gold to the bank via the UI button.